Where there's a candlestick, there's bound to be wax -- if the candlestick has ever been used. Candle wax clings to just about any surface -- glass, metal, resin or a combination of materials -- leaving you with a mess to clean up. The wax-removal method depends upon what the candlestick is made of; soap and water may suffice to get the last bits of residue off glass, but this treatment may ruin a wood-and-brass candlestick, for instance. Use the gentlest methods possible when removing wax to keep any kind of candlestick in top shape. 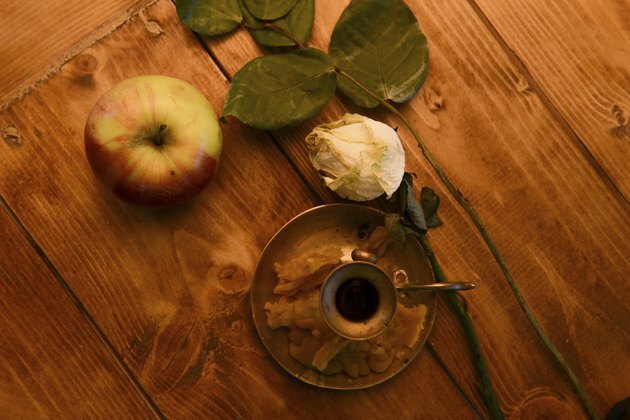 An empty candlestick with dried wax at the base on a table with an apple and a rose. Pick as much of the wax away as possible with your fingernail. If you don't want to use your nails, scrape it away with the bowl of a plastic spoon or the edge of a used plastic gift card. Place a solid candlestick, such as one made solely of metal, wood or glass, in the freezer for at least an hour. If the candlestick is made of more than one material, such as part wood and part glass, place a handful of ice cubes in a zippered bag instead. Set the bag atop one waxy area of the candlestick at a time -- just the glass, for instance -- for 10 or 15 minutes. Pry away the hardened wax with a plastic spoon or plastic gift card or use your fingernail. Freezing the wax sometimes makes it lift away from a candlestick with ease. Set the candlestick in a sunny location, if the sun feels especially warm, or heat it gently with a hairdryer set to low heat for 30 seconds or so. Blot up softened wax with a soft absorbent cloth or scrape it away with a fingernail or plastic spoon. The hair dryer method helps melt wax trapped in carved or detailed areas that may be hard to reach with a spoon or gift card. Repeat the heating, blotting and scraping process until the wax is gone.